“I think this is a whole new level of weirdness,” says Matthew Leifer, a theoretical physicist at Chapman University in Orange, California. Jim, is this not what we have said in here before? i.e. that once we realize how quantum particles behave, we also have to accept that quantum systems, like ourselves, also must be subject to these laws and behave like quantum particles. It is that "macro-quantum spookiness" that we experience every day. I mean, I use X and Y when really they are both X, but the "ontic" of course meaning "ontological" and "phenom" meaning "epi-phenomenal." I also call this " the XrelXstat" nature of perception. The reason the math works out right is only because it always takes at least two brain cells to form an imagination. And I wish to both take credit for this formula and not take credit because it really only is Bell's inequality. But I kind of pat myself on the back, that writing it out this way, is a whole lot easier to understand than Jon Stewart Bell. This really needs its own topic in here. But of late, there are not that many of us in the world who have had their "Alices Bobbed" in this way. 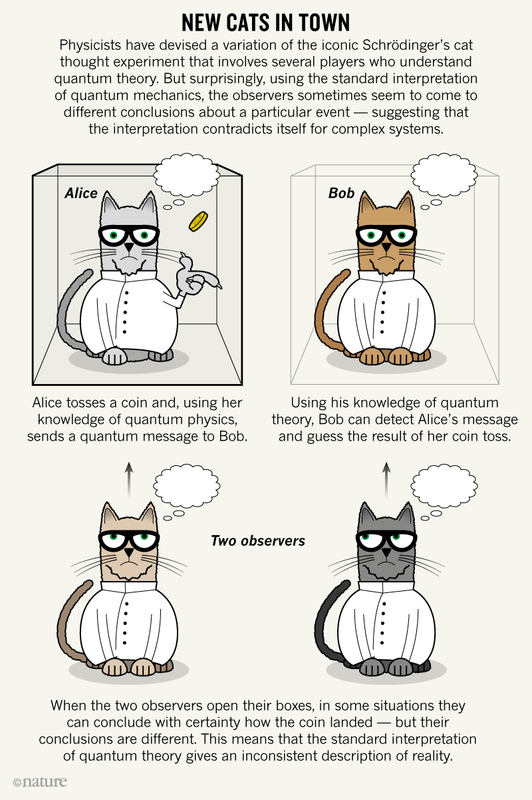 This topic you opened with the new Schroedigner's cat is a great place to introduce Bell's Theorem written this way. So here are some thoughts about why I think quantum physics is just physics. It is a little counter intuitive to think that we ourselves experience multiple realities, but our memory of reality is for the most part only one memory. Transcendental meditation, lucid dreaming, OBE, sweat lodge, psychedelics, etc. may be examples of glimpsing our true non-collapsed wave form realities. But, it is our packetised nature of reality that allows this -- similar to a RPG (role playing game) we only experience what the "Program" allows us to experience. This consensus reality comes from a very small part of the universal reality where the multiple players observe and remember the same thing (or close enough to the same thing that we are comfortable with small amounts of uncertainty). Materialists historically depended upon universally consistent reality. Whereas quantum science today generally has dismissed materialism and replaced it with physicalism ... soon to be replaced with universalism. By definition my reality and your reality have differences (I am not you and you are not me). Even if mind upload one day were to become possible and my consciousness were inserted into an eagle flying, I still could not experience what it is to really be an eagle flying. I would simply be myself inserted to an eagle's body. In order to truly experience what it is to be an eagle, I would have to fully become that eagle, and then lose so much of myself, that I cannot have the memory of what it was to be that eagle. The best visual I have found that really explains this well enough is this little piece from Candice Shelby I have had on my non-virtual blog for some time.